How much time do your kids spend on their screens? If you’re like a majority of parents, you probably think it’s too much. 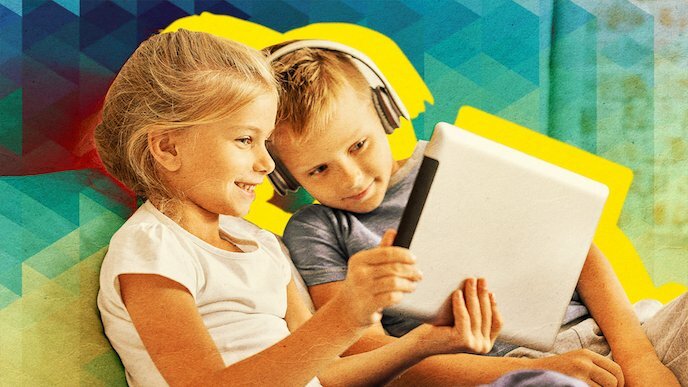 The jury is still out on what effect this sizable uptick in electronics usage is having on our brains, but most of us can agree we need to be aware of the amount of time our kids spend in the digital world. Nobody’s talking about going cold turkey from digital media, but there needs to be a balance. According to a Common Sense Media study, 59% of parents believe their kids are “addicted” to their screens. Whether that’s accurate or not, it’s a sign that we’re concerned and don’t really know how to manage online time appropriately. Parenting is all about setting limits, and screen time can be a major battle in some households. Here’s a list of useful suggestions for managing expectations and keeping gaming a healthy percentage of your kids’ leisure time. Children thrive on concise, easy to understand rules. As their habits form, setting hard and fast screen time limits can be the best way to build a framework for healthy media consumption. Many families find success with regularly scheduled screen time throughout the week in chunks of thirty minutes to an hour, with exceptions made for travel, sick days and the like. This lets kids enjoy the same entertainment as their peers without overdoing it. In addition, it’s smart to treat screen time just like any other leisure activity and require them to finish chores and homework first. Making it a contingent reward for their responsibilities helps establish gaming and digital media as a privilege, not a right. These limits can start stretching a little as children age. School may require the use of laptops or tablets for research or other projects, and that time obviously shouldn’t count against their gaming. Parenting is a constant process of re-assessing development and results. When you do make changes, it’s important to bring them into the conversation and ensure they have a voice. One of the toughest balancing acts in modern parenting is teaching kids about healthy screen time management while also setting a good example with our own devices. Sure, you use your phone for email and navigation and all the other important tasks of the modern age, but from your kid’s perspective you get to look at it whenever you want to, so it’s not fair that they don’t. It’s easy to get sucked into arguments over this, but the best solution is to change your own behavior to model for your children. Many families have found success with “phone off” hours, where adults turn their ringers off except for emergencies and deliberately unplug. That communicates to kids that screens aren’t a 24/7 proposition, but rather something that has a distinct time and place. Nobody expects you to follow the exact same rules as your children do, but letting them know that you also see value in limiting screen time for yourself can help the pill go down easier for them. It’s hard to insist on consequences when rules are broken. Nobody wants to be the bad guy. But if your kid is violating the restrictions you set on screen time, it could be symptomatic of bigger issues and you owe it to them to intervene. Once you’ve taken the time to set those clear rules, you need to be able to enforce them. Appropriate punishments will depend on your priorities and values as a family, but keeping the correlation direct has proven to be effective. Unauthorized or excessive device usage can be countered simply by losing access to those devices for a period of time. It’s important to communicate that their loss of screen time is a direct result of their actions, with no ambiguity. If they do need to use devices for schoolwork, you will have to closely monitor their activities to ensure that they stay on task and don’t drift off into other activities. This won’t be easy, but don’t succumb to the temptation of trust. Your kid needs to know that appropriate screen usage is something you legitimately care about. It can be hard as a parent to navigate the rapidly-shifting social world of children. The new generation uses digital spaces for socialization in different ways than we do, and understanding that difference is vital to setting reasonable limits. When we were young, it wasn’t unheard of to spend hours on the phone with our BFFs as our parents fumed (or finally shelled out for a second line). Modern teens are doing the same on Instagram and Facebook. If you child is using screens for socialization, it’s important for their development to let them have the time and space to do so. That’s not to say that they need unfettered access, but just like your parents let you use the phone when your homework was done, there’s nothing wrong with them doing the modern equivalent. Of course, lay out clear rules on the kind of behaviors you expect them to have as well as the privacy they can – and cannot – expect to have online. The market for screen time management is big enough that private companies are getting in on the act with software and hardware solutions to automatically monitor the amount of time users are spending on their devices and shut them off or deliver alerts when they hit the limit. Apple’s recently-introduced Screen Time is a system for iPhones and iPads that lets parents monitor and limit device usage. Every week, it prepares an analytics report that displays how much usage the system got, what the most-used apps were and more. It can also be used proactively, with a warning notification if you’re reaching your limit as well as a hard block option for those with less self-control. Many modern video game systems have similar controls. The PS4 allows parents to set rules based on total duration and times of the day for each day of the week, warning kids when their time is about to expire and logging them out of the system when it’s up. The Xbox One has a similar family timer, as does the Nintendo Switch. There are certainly advantages to using tools like this to manage screen time. There’s no negotiating with a computerized clock, after all. But they also remove the parent’s agency from the process. Your relationship with your kid is going to determine whether automated times are appropriate for your family. Managing screen time can be a challenge, but it’s not insurmountable with a little planning and work.